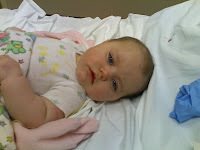 Do you all remember that week that we had 2 er visits and a ton of dr. appointments? Well, last week was comparative. Steph, Jason and Lane came for a visit on the 2nd of January and stayed until that Sunday. We had a ton of fun, and Steph and I left our babies- for pretty much the first time, and went and sang karaoke in Bozeman. It was a blast! Then Sunday came and they left. Lane got sick with the vomits Sunday when they got home, and I was thankful we didn't have it. WRONG! Monday night we took the kids to watch "Alvin and the Chipmunks", and while there, Ansleigh started puking. Actually, she puked a good one before we left the house and then again while I was in Gandolfo's getting sandwiches. But when we got the movie, it was every fifteen to twenty minutes. She would fall asleep and wake up to puke, and then go back to sleep. So I called the Doc. He said that he couldn't really tell if she was ok without looking at her, so he said if I wanted to go into the ER that would be ok. Jaran thought she was getting better, so we decided to just go home. On the way home she puked and when we got home she puked. So I called the doc again. By this time she was only vomiting bile... and the doc again said that he would- and I quote- "support my decision should I decide to take her into the ER." So I called my dad. For those of you who don't know- he was a medic for a bagillion years and knows about most things Dr.'s do anyway. So I called him and he told me that I should probably take her in. While on the phone- she puked again. Got her to the ER... and she puked while checking in. The nurse there- poor guy- felt bad for the poor little girl. So he hurried us into a room, and we got settled. The on call doc came in to look at her and, while she was puking, decided she definitely needed an IV. So the drama begins! This is my poor baby just lying on the bed, awaiting the torture that now ensues. Can't seem to get into that tiny little vein. 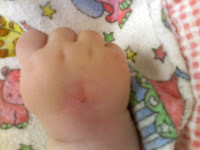 So he decides to go for the left hand, get's it going, and the vein blows. For those of you who don't know what this means, it's when the wall of the vein gets too much pressure and gets a small hole in it. That's the best way I can explain it! So he feels bad and gets two lady nurses to come in and give it a shot. They decide to try the right foot. They poke around and- yay- they get it, only to have it blow on them. So they go back to the right hand. They have no luck. So they call up to the labor and delivery floor to see if the nursery can spare a nurse so she can come try. 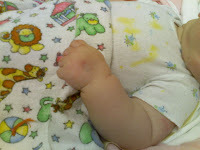 They are better at getting IV's on babies- seeing how they do it quite often. So luckily- one came down. She looks at all her options, and decides to go for the left foot. 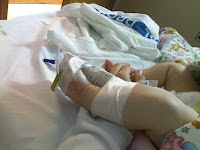 As soon as she gets in, she gets a good vein, and finally gets the IV going. 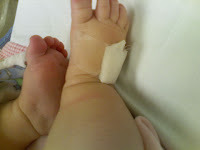 It's sort of in the crook of her ankle, so they have to strap her foot onto a board. So the fluid takes about an hour to get into her, and throughout the whole thing she's been trying to sleep. She only wakes up while being poked with numerous needles and while they have the rubber turnuquates on her. She was quite the little trooper! We entered the ER at 11:30PM and don't get home until after 5AM. So I end up getting only about 2 hours of sleep, because even though the fluid made her feel a little better, she was still puking. I keep leaving out details, such as her eating at 4PM and not at all again until after we got home. Also- no wet diaper since 5PM which is one of the reasons I took her in in the first place. So I had extremely sore baby-feeders and pumped as soon as I arrived home. Jaran had to work the next day- so I was a mess and so tired I could taste it. The next evening the Dr. wanted me to take her back to the ER as she was still seemingly dehydrated... but when we got there, they didn't want to put her through the same thing, and decided she was hydrated enough to wait it out. Now she is doing fine, and back to my pretty little happy girl! Thanks goodness for modern medicine... as she would not nurse at all, and trying to push the pedialite only made her vomit more. We would have lost her had it not been for the advances in the medical field! We are so thankful for it! I am on the recovery path now, trying to take a nap here and there to make up for not sleeping, but happy and healthy! Talk about break my heart. Poor Ansleigh. I hate watching any child, especially my own babies, go through that sort of thing. I didn't know Stephanie even had a baby! Gotta go. Have a better day today! Oh Poor baby girl! I feel so bad for Ansleigh! Kaleb went through the same thing when he was 14 months old, he got Rotavirus and he had horrible diarrhea and was throwing up like crazy...so we took him to the ER and he was so dehydrated so they gave him an IV but they poked him 10 times! It was horrible! Twice in both arms twice in both legs and twice in the head! They finally called the labor and delivery floor to get a nurse too...and I was thinking Hello, why didn't you do that in the first place!! Kaleb was screaming and I was holding him down while they were poking him and just the look that he gave me…was super sad…like he was saying...Mom why are you letting them hurt me? HELP ME! I hated it! So I know what you must have felt during the whole thing! So I am sorry and I hope she is feeling better! And I hope you caught up on your sleep!